Professional strength glass cleaner that quickly removes dirt, grime and fingerprints without leaving streaks or residue. Ammonia based formula. Dries fast, simply spray and wipe. Not for use on tinted or acrylic glass windows or any surfaced harmed by water. Application: Mirrors; Windows; Glass; Water-Washable Surfaces; Applicable Material: Glass; Chemical Compound: Butyl; Cellosolve; Ethylene Glycol Monobutyl Ether; 2-Butoxyethanol Ethanol; Ethyl Alcohol; Dirt Types: Dirt; Fingerprints; Grime. 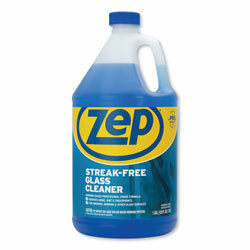 Glass Cleaners from Zep Inc.! 283 In Stock today.